Aggies Do It Better: Updated Basketball nails for 2015! 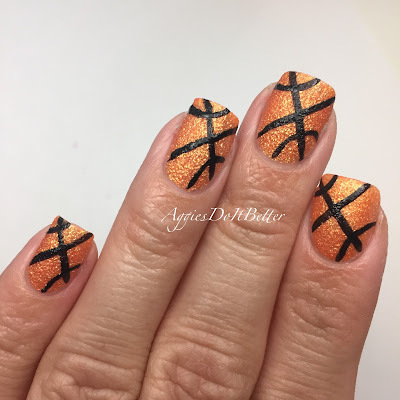 Updated Basketball nails for 2015! Hey guys! Happy Sunday! I'm still so excited about American Pharoah's win for the Triple crown yesterday!! For today I decided to re do my basketball nails from last year so I could film. 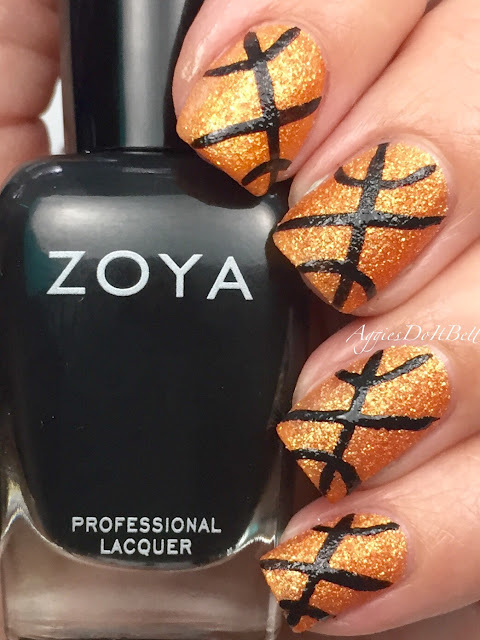 These nails are my 2nd most pinned nails on Pinterest--Yall love some basketball! These couldn't be easier to do. 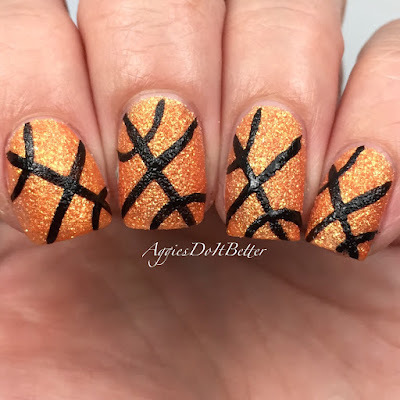 You don't have to use a textured polish, you can use any orange or brown even polish....I just like the way it looks because basketballs are textured! You can see my original post here. I used Zoya Beatrix for the base, it's a bright orange textured Pixiedust and my fav for basketballs. When I first did these, I used a black striper which you can buy pretty much anywhere these days. But I have found that it's so pigmented it always smeared when I used it...ALWAYS. (Like when adding topcoat). So I ditched it and use a striping brush now and regular black polish, which is available in pretty much any nail art kit or at a craft store...just look for a long skinny thin brush! 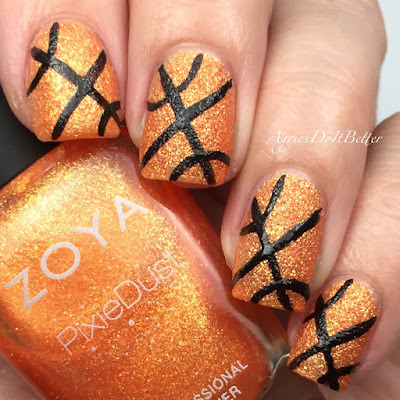 After your base is dry, just dip your striping brush in the bottle...I used Zoya Willa, and make a big "X" on your nail with straight lines. Then, add a curved line at the top end and the bottom end. I have the shakiest hand ever and I can do this, so that tells you how easy it is! You can have all your basketballs going in the same direction or not, its up to you! I didn't add topcoat because I used a textured polish! Be sure to check out my Instagram page for the video tutorial! I seriously love these so much. And I love how Beatrix glows! American Pharoh nails for the Belmont 2015!